PT Indosat Tbk - Indosat or more popularly called "Indosat Ooredoo", IDX:ISAT) is a major internet and cellular providers in Indonesia and is positioned inside the top three of cellular operators in Indonesia in terms of total subscribers. Indosat has more than 69 millions active subscribers as at the end of September 2015. Indosat Ooredoo is a local subsidiary company of Qatar-based Ooredoo Group (previously known as Qatar Telecom), one of the largest telecommunication services companies in the Middle East and North Africa regions. At present, 65% of its shares are held by Ooredoo Group through Ooredoo Asia Pte Ltd, 14.29% by the Government of Indonesia, and 20.71% remaining shares by investor and public shareholders. 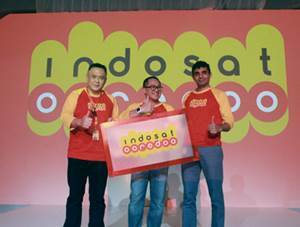 Indosat Ooredoo is based in Jakarta and now has 5 subsidiaries and 5 affiliated subsidiaries. Indosat Ooredoo's subsidiaries are PT Aplikanusa Lintasarta (72.36%), PT Indosat Megah Media (99.85%), Indosat Palapa Company BV (100%), Indosat Singapore PTE Ltd (100%), PT Starone Mitra Telekomunikasi (84.08%). Indosat Ooredoo's affiliated companies comprise of PT Interactive Vision Media, Indosat Mentari Company BV, PT Lintas Media Danawa, PT Artajasa Pembayaran Elektronis and PT Citra Bakti Indonesia. Indosat Ooredoo's performance in the third quarter of 2015 (3Q 2015, ended in 30 September 2015) improved over the previous year. Indosat Ooredoo registered total consolidated revenue of Rp 19,582 billion in 3Q 2015, according to Indosat Ooredoo Corporate Presentation 3Q 2015 as cited by JobsCDC.com. These total consolidated revenue figures reflected an 10.5% increase as compared to total consolidated revenue in 3Q 2014 amounted to Rp 17,717 billion. Background in Bachelor Degree (S1). Required experience for minimum 3 years in Supply Management. Have a good skill in SAP Sales Distribution. Advanced skills in Database Process and Microsoft Excell. JobsCDC.com now available on android device. Download now on Google Play here. Please be aware of recruitment fraud. The entire stage of this selection process is free of charge. PT Indosat Tbk - Channel Management Admin Indosat Ooredoo March 2016 will never ask for fees or upfront payments for any purposes during the recruitment process such as transportation and accommodation.